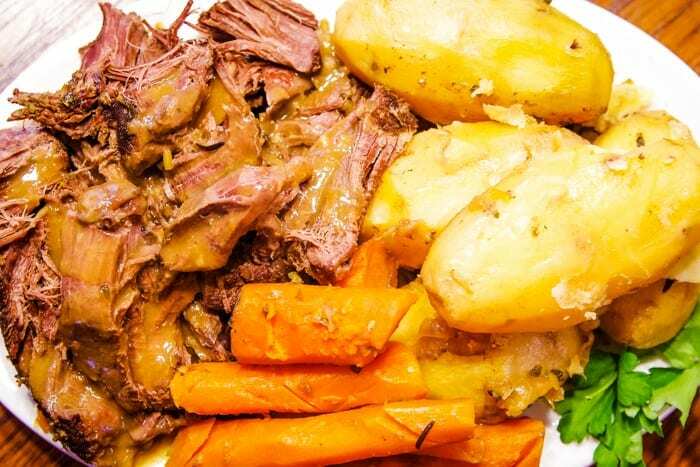 Slow cooked in the oven, this mouthwatering venison roast with carrots, onion, potatoes is topped of with homemade flavorful gravy. If you haven’t figured out by now, I love to cook with venison. When you are married to a hunter, it’s just one of those things. 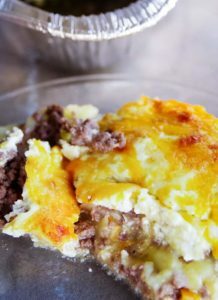 Whether it’s bone-in venison steaks using the Instant Pot or how to make hunter’s casserole with ground venison, they’re all a family favorite. 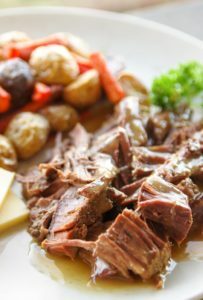 Today I’m excited to show you how to make a mouthwatering venison roast with carrots, onion, potatoes and an incredible gravy made from six hours of slow cooked flavor in the oven. With wind chill temperatures setting new records this week, there is no better day to turn on the oven and fill my home with the aroma and warmth of roasted venison. Simple, healthy and so, so, so good. There are varying ways I like cook different cuts of meat and venison is no different. 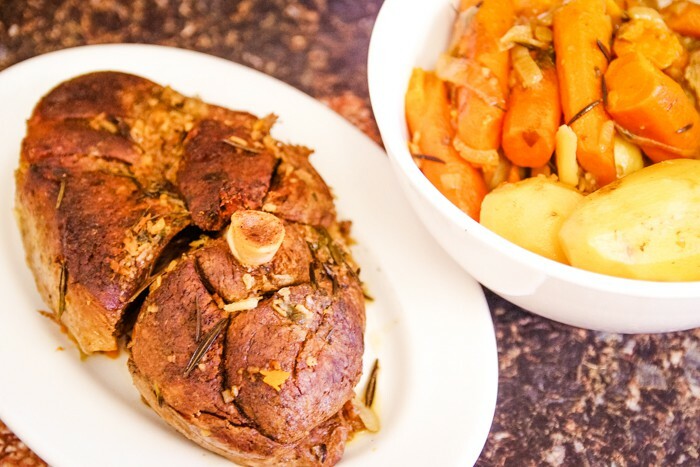 I have made bone-in venison roasts in my pressure cooker, but prefer the oven every time. Why? 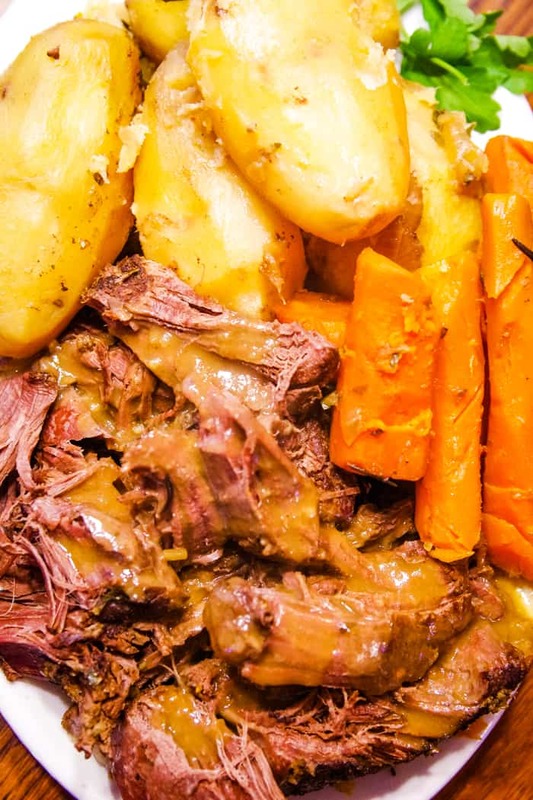 Roasts are the largest cuts of meat on a deer and are typically served with roasted carrots and potatoes, making a large sharable meal that needs the space of a stockpot. The oven gives plenty of time for the meat drippings to blend with everything in the pot so you can make the most delicious gravy. What about the slow cooker? I still prefer the oven. To me, the perfect baking temperature for a bone-in venison roast is 250 degrees, which is not an option on conventional slow cookers. The typical high of a slow cooker is 300 degrees and the low setting is only 200 degrees. The oven allows you to bake your roast using the same pot you seared your vegetables and browned your meat – adding even more flavor. I learned this trick from The Pioneer Woman. 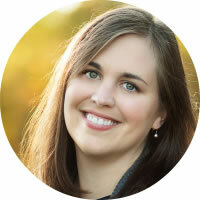 She is one smart lady! 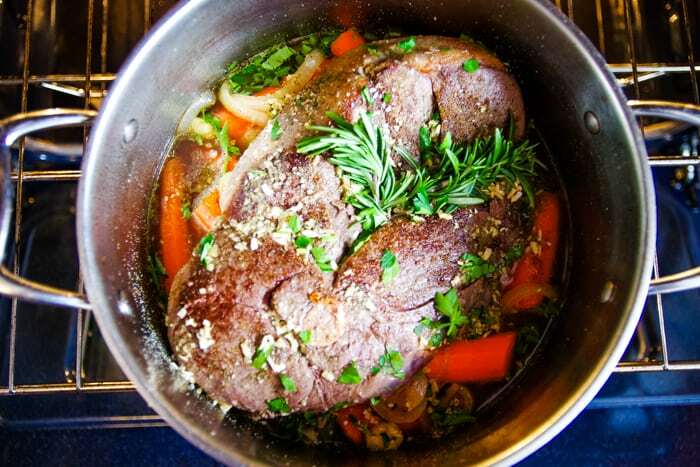 Are you ready to make a spectacular baked venison roast to share with your loved ones? 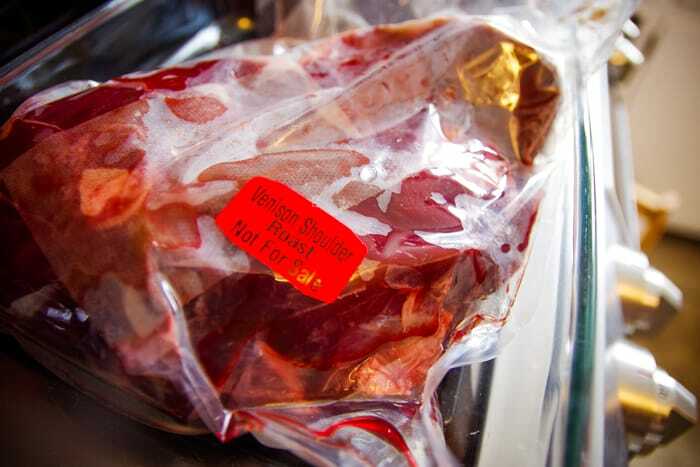 Step 1: Let thaw if frozen. Here is my three-pound venison shoulder roast. Thank you, hunter husband! I took it out of the freezer yesterday to let it thaw in the refrigerator overnight. Unlike my venison steak recipe, venison roast is best cooked when the meat has been thawed out and browned. 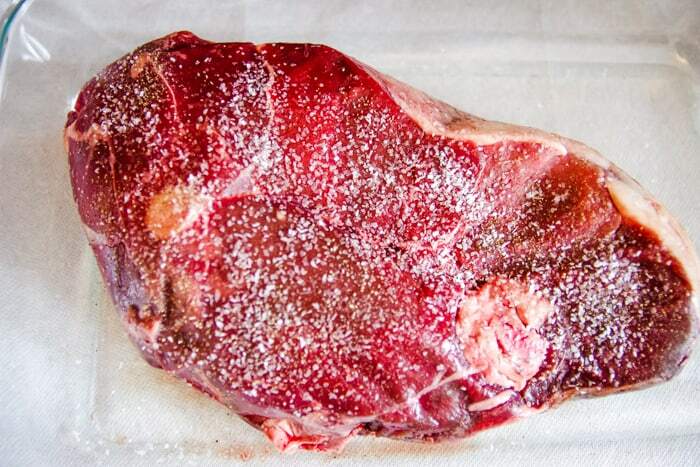 Step 2: Take the thawed meat out of the package and generously season both sides with kosher salt and cracked black pepper. 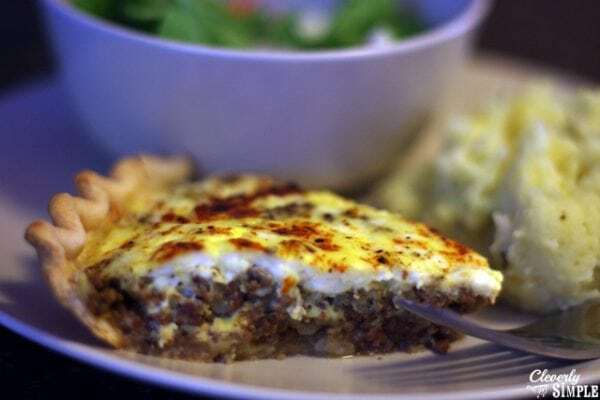 Set it aside to rest as you prepare the other ingredients. Turn your oven on to 250 degrees. Step 3: You will need 5-6 peeled and chopped carrots. I never halve the length because the oven will give them plenty of time to tender up. Slice up 1 medium yellow onion and peel 4 garlic cloves. You will also need one sprig of fresh rosemary (another trick from The Pioneer Woman that makes such a difference! ), fresh parsley, and some onion soup mix. I like to use the homemade version. All of these ingredients will cook in a small amount of quality beef stock. Don’t worry if this seems like too much salt. We will add potatoes later during cooking and they will need it. Step 4: Heat up a large stockpot over medium-high heat. When the pan is hot, pour in a generous amount of olive oil (approx. ¼ cup). The oil has to last us through the searing of two batches of vegetables as well as the meat. 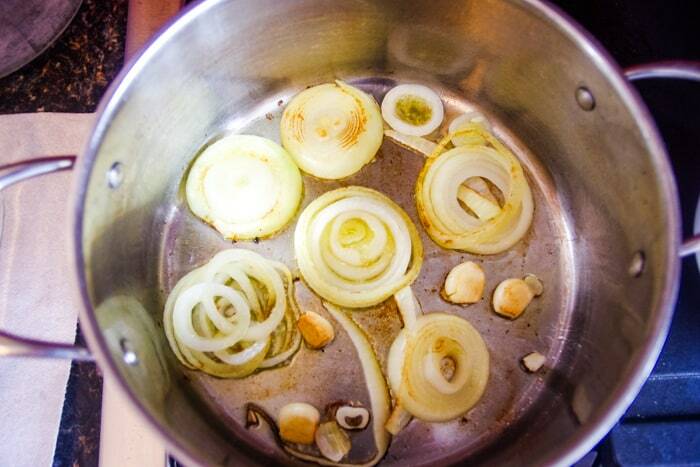 When the oil is hot, place your onion rings and garlic cloves in the pot. Cook for 2 minutes on each side or until the onions are translucent and crispy brown edges are formed. Be careful not to burn the garlic. If it helps, you can start with the onions and add the garlic halfway through. Remove the onions and garlic and set aside in a large bowl. 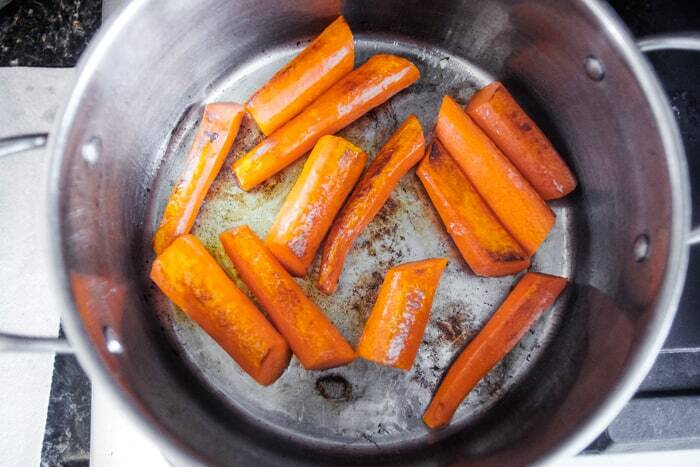 Step 5: Using the same method, sear your carrots for about two minutes per side. Searing the onions, carrots and garlic will bring out the sugars from the vegetables and provide a really deep flavor to our dish. When the carrots start to show browning on both sides, pull them out and add them to your bowl of onions and garlic. Step 6: Make sure you still have some oil at the bottom of the pan. Then lay down one side of the seasoned meat into the pan. You will hear it sizzle! 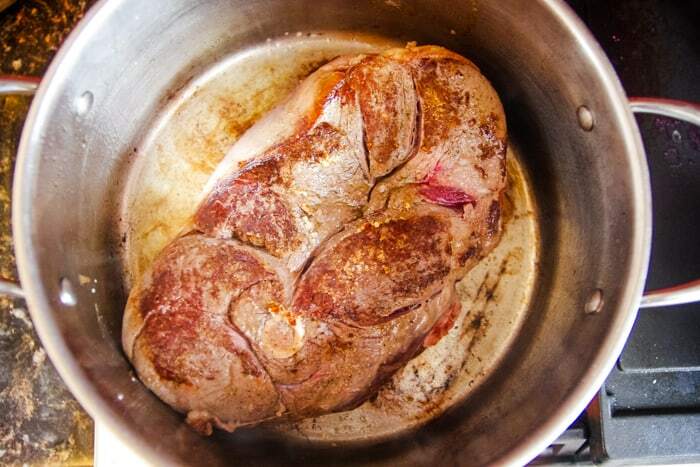 Allow the meat to brown for one minute on each side before removing it to rest one more time. Step 7: Working quickly, whisk 1/3 cup of beef stock into the browned bits at the bottom of the pan and keep whisking until they are part of the stock. Turn off your heat. Step 8: Layer the bottom of the pan with the vegetable mixture and top with the browned roast. Split the rosemary sprig in two and lay it on top of the meat followed by one tablespoon of onion soup mix per pound of meat. Since I have a three-pound roast, I added 3 tablespoons of mix. 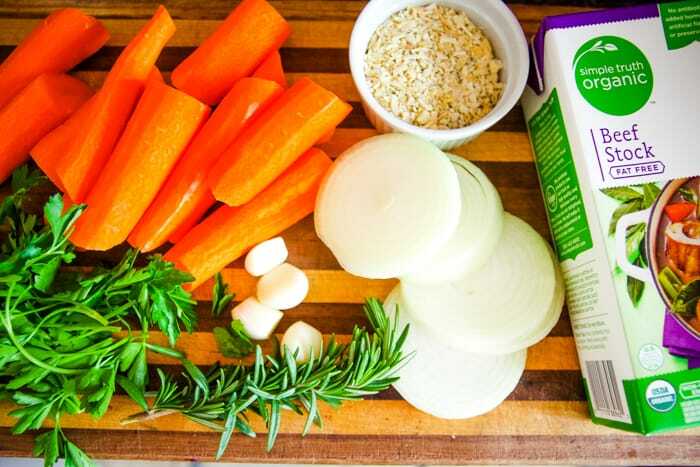 Also add 2 tablespoons of fresh chopped parsley and only 1 ½ cups of quality beef stock. We don’t want too much liquid because the fat from the meat will add some as well as the vegetables. Cover the pot and bake for 3 hours at 250 degrees. Your kitchen begins its mouthwatering smell about 2 hours in. Step 9: At three hours, slide the pot out and carefully (use hot pads!) add some peeled and rinsed russet potatoes around the edge of the meat and on top of the carrots, onions and stock. You could also use red or yellow potatoes and leave the skin on if you like that! At this halfway point, I also like to move the rosemary from the top of the meat and poke it down into the juices. Slide the covered pot back into the oven and bake for an additional 3 hours at 250 degrees. Step 9: When the six hours has ended, carefully remove the stockpot from the oven, take out the roast, and place it on a platter. Cover it with foil so it stays warm. Remove all of the vegetables and place them in a bowl and cover with foil. Strain the remaining stock using a fine mesh strainer or a gravy separator and pour it into a liquid measuring cup and set it aside. 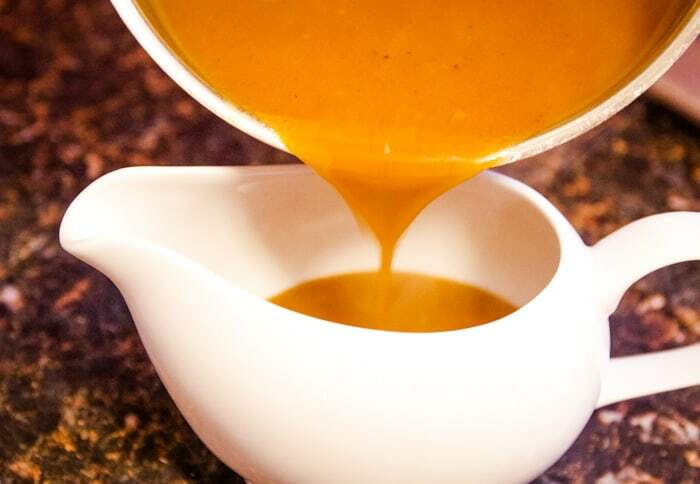 Since our roast cooked for so long, we will have some incredible pan drippings to make gravy. After you have removed everything from the pot, add 2 Tablespoons of unsalted butter. Melt the butter and then add 3 Tablespoons of flour (or potato starch for gluten free friends), whisking them together to form a paste. 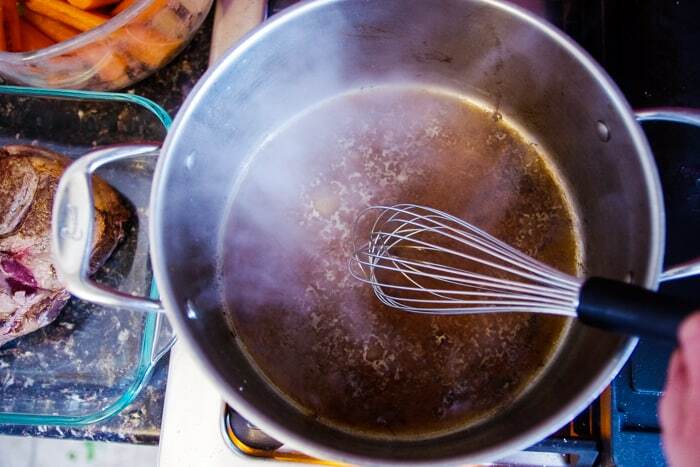 Allow it to cook for 1 minute before whisking in your reserved stock and drippings. Whisk just until it is thickened and turn off the heat. Why the oven for a venison roast? 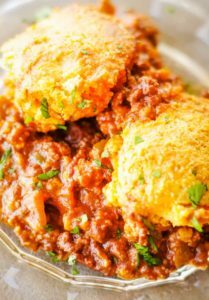 Our recipe calls for a baking temperature of 250 degrees, which is not an option on most conventional slow cookers. In addition, you can pre-sear your vegetables and brown your meat (both important steps) in the same pot used for baking. Why should you pre-sear the vegetables? Searing the onions, garlic and carrots will pull out the sugars from the vegetables and remove some of the water. The result is more flavor for our dish. 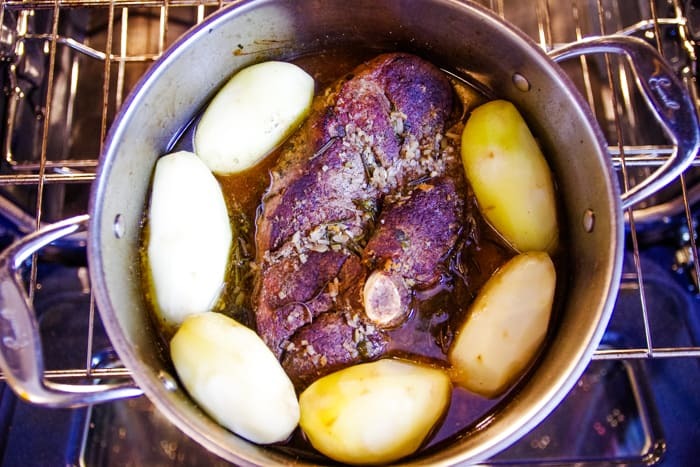 Why should you brown the venison roast before baking? Browning meat before cooking is really all about flavor. The caramelized surface of the meat will give so much more flavor to the final dish… plus it looks more appetizing! Can you make this roast ahead? 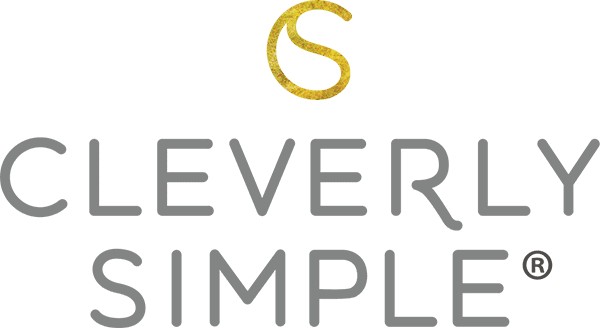 Yes, you can prepare the roast as featured (minus the 1 ½ cups of stock) and place the entire stockpot in the refrigerator to chill for up to four hours before baking. When ready to bake, add the additional stock. You can also put the chilled stockpot into a cold oven, add the stock, and set your time bake feature for up to one hour ahead. 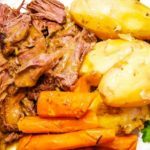 Can you cook venison roast in the slow cooker? Yes, but I still prefer the oven. 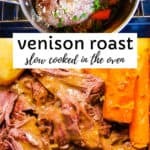 The perfect baking temperature for a bone-in venison roast is 250 degrees, which is not an option on conventional slow cookers.